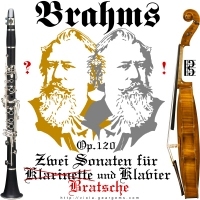 What was Johannes Brahms thinking? Opus 120: Two sonatas for clarinet and piano, or viola and piano? A no-brainer, of course! We know he actually wrote them for both instruments, but this design was inspired by a violist who wanted something of this sort back in 2004 as a tease for her clarinet-playing husband, so we happily obliged! And now you too can own it! Buy this design now on any t-shirt or apparel item, tote bag, mug or other quality gift exclusively from Bratsche’s Viola Bazaar!